It’s not every day that guests at Denali Princess Wilderness Lodge have their dinner delivered by helicopter. 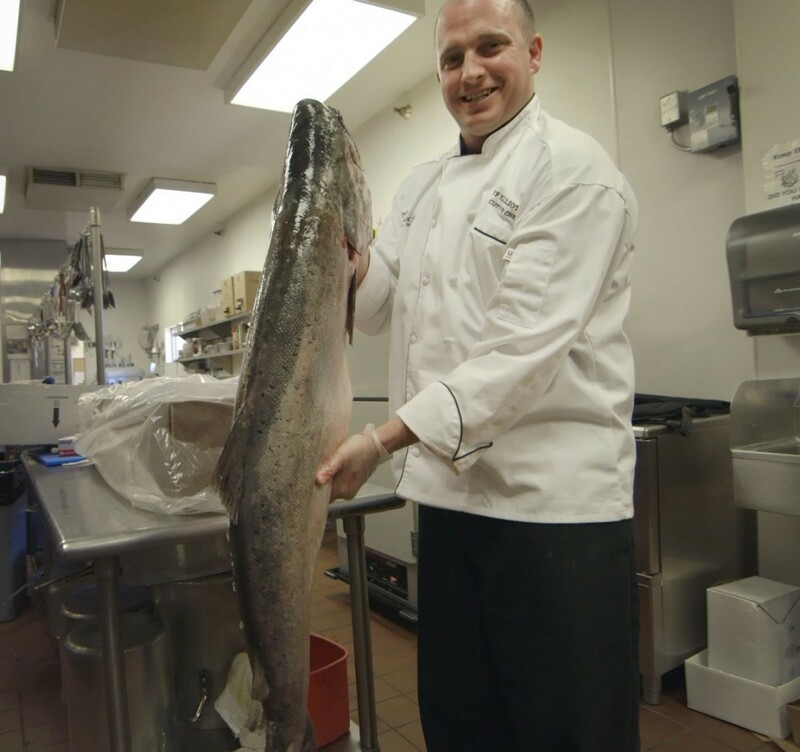 That, however, was the scene on Friday, May 15 at the lodge located just outside Denali National Park and Preserve where Chef Jeff Elliott received a special delivery of the season’s first Copper River king salmon. Just hours earlier, fishermen in Cordova, Alaska, pulled into the docks and unloaded their catch, reeled in during the 2015 Copper River salmon fishing season opener on May 14. The fish was packed and flown on an Alaska Airlines jet to Anchorage, where it was met with a ceremonious reception. Minutes later, the boxes of fresh, wild salmon were loaded into a helicopter for a two-hour flight to the lodge and into the hands of the King Salmon Restaurant kitchen staff who prepare and served the fish to guests from around the world. The first-catch shipment of Copper River salmon is a prestigious and highly anticipated annual ritual in which Alaska Airlines flies more than 20,000 pounds of the season’s “first fish” to Anchorage and Seattle. For the last three years, the Denali Princess Wilderness Lodge has received part of the catch and served fresh king salmon to lodge guests on arrival. Chef Elliott shared in the excitement over the fresh, succulent fish with lodge guests who were offered the option to order any salmon dish off the menu and have it upgraded using the freshly caught fish. The red-colored meat of Copper River king salmon has a melt-in-your mouth texture and is highly coveted by chefs and salmon lovers alike thanks to its exceptional flavor and high nutritious value. Also known as Chinook, the king salmon travel 300 miles from the Pacific Ocean along the waters of the Copper River to reach their spawning grounds near Cordova.